I’m a UX designer at Egnyte, a GV portfolio company that delivers enterprise-level file storage and content governance solutions. My design team works on product features from conception to release. We’re in the weeds on a daily basis, but reflecting on our experiences gives us a chance to improve our craft. An initial step in the user research process is user research recruitment. This critical first step consists of locating the right participants. My design team started off with internal recruitment at our company, the easiest way for us to get participants. Once we learned more, we tried other strategies that led us to recruit participants with less biases—and who were more aligned with the real users of our products. As our user recruitment became more nuanced and less time-consuming, my team spent more time actually conducting research and designing features. My team’s evolution can help your team figure out where to start or continue your recruitment strategy. In this post, I’ll dive deeper into when to use a certain method and what the associated pros and cons are. 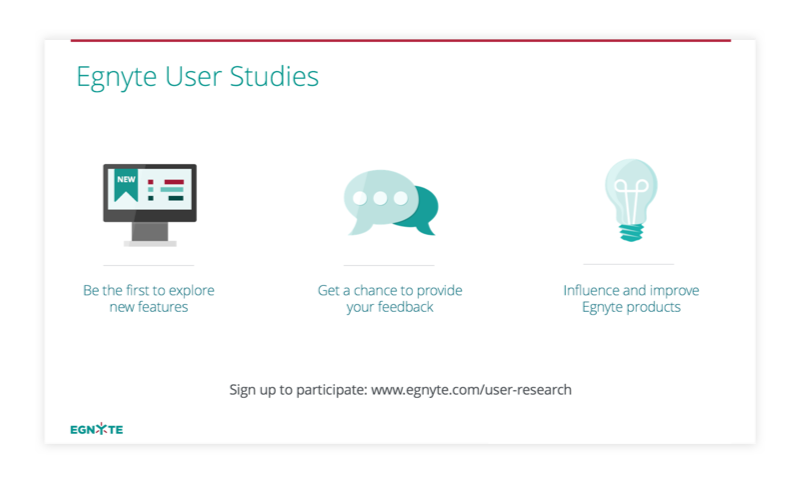 The first time I conducted usability testing at Egnyte was a few weeks after I started. The team was working on a redesign of our web interface. One struggle was the placement of the navigation items. I suggested performing quick usability testing because I was new to the team, and I could be less biased than the rest of team who had been working on this project for the past few months. At first, I was nervous since we didn’t have a formalized process for usability testing. I walked around the office and asked people if they could spare some time to provide their opinion, and they wound up giving feedback that helped us understand our own blind spots and guided us to our final decision. This was an effective way to get more information on a design, especially when we had differing opinions. Despite some initial rejection during this first experience, I was hooked. In the past, our team reserved formal research for large-scale projects because of high resource costs. Now we’re able to incorporate some form of it in every project we work on. As the user experience design field matured, we noticed user research as an emerging trend. At one point, we came to a crossroads: Should we continue to rely on our intuition as designers to create solutions? Or should we spend time to see how we could incorporate user research? We decided on the latter and started experimenting. We began to progress in creating a process and trying different recruitment strategies. Along the way, we ran into some problems. Since our team works on diverse projects, we had to evolve our recruitment strategy in a scalable way. So we started with recruiting our own employees, because it’s the easiest. We built upon that with external recruitment. After a while, we realized that the process of external recruitment took too much time. With that realization, we incorporated recruitment services like User Interviews. Now that we’ve established our base recruitment methods, we’re focusing our efforts on adding customer recruitment to our repertoire. One vital factor that aided our user research efforts was getting buy-in from the top of the chain. My design team is lucky to receive support from our CEO and our manager. They believe in the value of product design and user research. As a result, we’re able to leverage design to impact the company. At companies that aren’t design-centric, designers need to convince executives that design is essential. By spreading the word on the importance of design to people in your company, you become a design evangelist and people will start seeing design in a different light. Start off small, like with a lunch and learn that explains the benefits of product design for a company. Diving deeper, you can invite coworkers to observe a usability testing session and see for themselves the valuable insights you can learn just from talking to people. This is an efficient method to use because it saves both time and money. Since everyone in our company uses our product to at least perform basic actions, we have a close user base to draw from. We recruit from departments more removed from the product to decrease the likelihood for biases. We recognize that employees can harbor more biases than customers or external participants. We initially sent out a company-wide email to gather info on interested participants. Then we created a usability research calendar that enabled us to see when participants had free time. This calendar is helpful for the team to know when to schedule usability testing. We use this method when we are in a time crunch or need usability testers with a deeper understanding of Egnyte. External recruitment was a natural next step. There were many ways we could reach participants and there was a range in the amount of effort we had to put in. We first reached out to friends on Facebook and through direct messaging. At this stage, we were moving beyond our comfort zones—and generally speaking, any research is better than nothing. We then took it a step further and performed usability testing at Starbucks, incentivizing people with a free drink. This wasn’t a great way to request feedback because people weren’t as receptive in this setting. 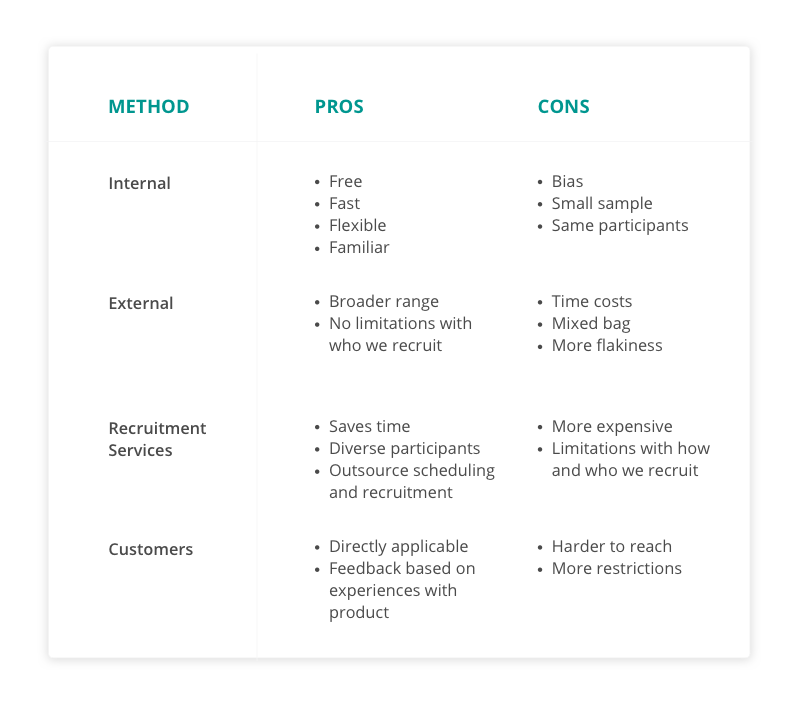 The primary downside of external recruitment is the amount of time and effort that goes into it. We don’t have a research coordinator, so we’re in charge of all the recruitment tasks. Sometimes this can all get pretty hectic, so we created a checklist of actions to run through. We also leave ample time between sessions with external participants. This is a great method to use when you need participants who are new to the product or are more diverse than internal participants. After a few months, we reviewed the time we spent on recruiting external participants—it was a lot. We thought about how we could be spending this valuable time refining our research scripts and prototypes. We already had buy-in from people in charge of our budget, so we decided to engage with recruitment services. The cost of these services can be a limiting factor, especially for smaller organizations, but our experiences with various recruitment agencies have been positive so far. The user base we get from conducting virtual user research is very diverse. These services help us out with most of the items on our checklist that we usually handle ourselves. We end up being less biased in recruitment, as these services have further reach than we do. For these virtual sessions, we use Zoom to share our screens and have participants take control of the prototype. We also use our Jabra speaker to ensure high-quality sound input and output. Interfacing with customers has always been a challenge for us because our product is enterprise focused—we’re currently limited to interacting with customers in specific instances. This doesn’t give us enough time to thoroughly conduct our research process. Sometimes we run betas with relevant customers for our larger projects in order to receive customer feedback before releasing the product. We also attend customer calls with product managers whenever we get a chance. These calls are more focused on a topic the customer has in mind, but we’re able to gather some solid feedback at the end of the session. Getting to where we are took time and exploration. We’re now prioritizing involving customers as part of our user research process. Reaching our customers is vital to receiving honest feedback from users who actually use our product as part of their workflow. This perspective is the most valuable because it represents our product in the real world. But reaching out to customers for an enterprise product is a whole other ball game. There are tons of limitations that appear in this situation. For example, admins in larger companies can disable our contact with end users so they don’t get spammed. We also have to be cognizant of how receptive customers are to speaking with us. This is where our customer success managers come into play. Their main role is to help Egnyte customers understand how to use Egnyte and deal with any issues. We rely on teams like customer success, training, and support to link us with customers. User research recruitment is the first step in the user research process, but it can easily set people back. Recruiting participants gave us that gentle push to continue with the research process, and we used that momentum to set up a user research process that works. How does your team handle recruiting user research participants? Tell us on Twitter: @InVisionApp. She’s obsessed with humans of all varieties and delving deeper into their minds through films, novels, and good ole people watching. Current grind: Trying to break her bowling PR and obtain that elusive 300.